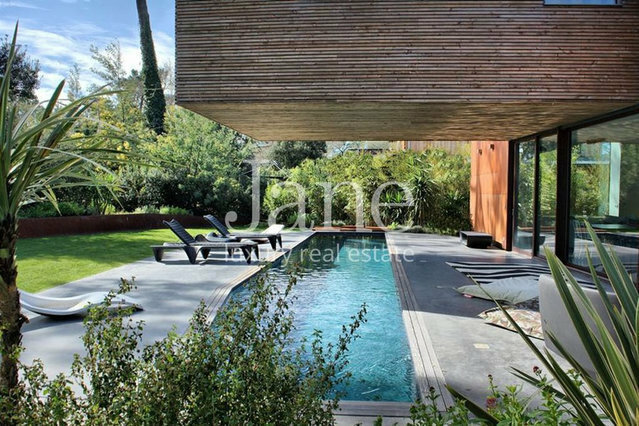 This house was featured in Elle Decoration magazine. With bold lines and ultra-contemporary aesthetic choices, this exceptional villa combines wood, glass and metal in a spectacular space, both inside and outside. 300 m2 of pure simplicity with the best of high tech and home automation, with 4 touch pads controlling light, blinds, WiFi, audio inside and near the pool. In the vast living room with impressive high ceiling, Gervasoni pristine white linen sofas contrast with the polished concrete walls and the rest of the furniture in dark tones: a Barcelona Ping Pong table, ​​Bang & Olufsen TV... In the same minimalist style, the kitchen with center island is fully equipped by Siemens, Liebherr, KitchenAid and Cuisinart. The 4 ensuite master bedroom with Treca Palace beds and Merci linen bedding each one with a Bang & Olufsen TV or home theater. 3 bedrooms offer a private office from which 2 of them have private terraces. On the first floor, one of the master bedrooms is characterized by an all glass bathroom to enjoy the views of nature from the shower or tub. It is extended by two private terraces, a double dressing room and a mezzanine office. In the garden in front of the large bay window of the living room, a heated lap pool 16 x 1.80 fit nicely into the environment. A charger for electric and hybrid vehicles is installed outside. 5 minutes away from Moulleau and golf course, 8 minutes from the city center of Arcachon and 10 minutes from the Corniche, luxury is reinterpreted in an ultimate modernity.